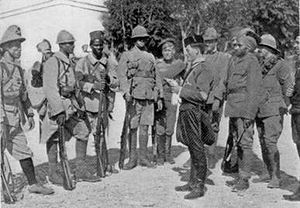 From left to right: a soldier from Indochina, a Frenchman, a Senegalese, an Englishman, a Russian, an Italian, a Serb, a Greek, and an Indian. 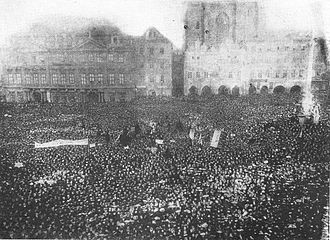 afterwards 4,300 (until May 1918). The Macedonian Front, also known as the Salonica Front (after Thessaloniki), was a military theatre of World War I formed as a result of an attempt by the Allied Powers to aid Serbia, in the fall of 1915, against the combined attack of Germany, Austria-Hungary and Bulgaria. The expedition came too late and in insufficient force to prevent the fall of Serbia, and was complicated by the internal political crisis in Greece (the "National Schism"). Eventually, a stable front was established, running from the Albanian Adriatic coast to the Struma River, pitting a multinational Allied force against the Bulgarian Army, which was at various times bolstered with smaller units from the other Central Powers. The Macedonian Front remained quite stable, despite local actions, until the great Allied offensive in September 1918, which resulted in the capitulation of Bulgaria and the liberation of Serbia. 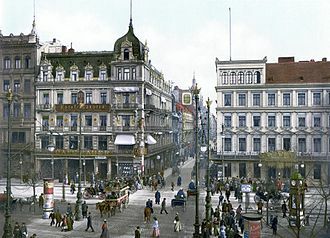 Following the assassination of the Crown Prince by a Bosnian Serb, Austria-Hungary had attacked Serbia in August 1914 but had failed to overcome Serbian resistance. After the entry of the Ottoman Empire into the war on the side of the Central Powers (November 1914), the decisive factor in the Balkans became the attitude of Bulgaria. Bulgaria occupied a strategically important position on the Serbian flank and its intervention on either side of the belligerents would be decisive. Bulgaria and Serbia had fought each other twice in the previous thirty years: in the Serbo-Bulgarian War of 1885 and in the Second Balkan War of 1913. Bulgaria had suffered defeat in 1913 and the Bulgarian government and people generally felt that Serbia had stolen land which rightfully belonged to Bulgaria. While the Allies could only offer Bulgaria small territorial concessions from Serbia and neutral Greece, the Central Powers' promises appeared far more enticing, as they offered to cede most of the land which Bulgaria claimed. With the Allied defeats at the Battle of Gallipoli (April 1915 to January 1916) and the Russian defeat at Gorlice-Tarnów (May to September 1915) demonstrating the Central Powers' strength, King Ferdinand signed a treaty with Germany and on 21 September 1915 Bulgaria began mobilising for war. 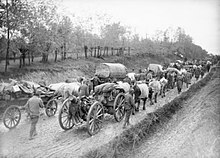 The retreat of the Serbian army at the end of October 1915 from Northern to Southern Serbia. A propaganda postcard commemorating the victory of the Central Powers over Serbia in 1915. The retreat of the Serbian troops in the winter 1915/16 across a snowy mountain in Albania to Adriatic coast. A dead Serbian soldier in the snow. Exhausted Serbian soldiers on the seashore in the expectation of Allied ships, February 1916. After the victory of the Serbian army in the Battle of Kolubara in December 1914, the Serbian front saw a lull until the early autumn of 1915. Under the command of Field Marshal August von Mackensen, the Austro-Hungarian Balkan Army, the German 11th Army and river flotillas on the Danube and the Sava began an offensive on 6 October 1915, the largest offensive against Serbia. By September 1915, despite the extreme sacrifice of the Serbian army, the Austro-Hungarian Balkan Army, having crossed the rivers Sava and Drina and the German 11th Army after crossing the Danube, occupied Belgrade, Smederevo, Požarevac and Golubac, creating a wide bridgehead south of the Sava and Danube rivers, and forcing Serbian forces to withdraw to southern Serbia. On 15 October 1915, two Bulgarian armies attacked, over-running Serbian units, penetrating into the valley of the South Morava river near Vranje up to 22 October 1915. The Bulgarian forces occupied Kumanovo, Štip, and Skopje, and prevented the withdrawal of the Serbian army to the Greek border and Thessaloniki (Salonika). For a year, the Allies (Britain and France) had repeatedly promised to send serious military forces to Serbia, while nothing had materialised. But with Bulgaria's mobilisation to its south, the situation for Serbia became desperate. The developments finally forced the French and the British to decide upon sending a small expedition force of two divisions to help Serbia, but even these arrived too late in the Greek port of Thessaloniki (Salonica) to have any impact in the operations. The main reason for the delay was the lack of available Allied forces due to the critical situation in the Western Front. The Entente used Greek neutrality as an excuse, although they could have used the Albanian coast for a rapid deployment of reinforcements and equipment during the first 14 months of the war. (As the Serbian Marshal Putnik had suggested, the Montenegrin army gave adequate cover to the Albanian coast from the north — at a safe distance from any Bulgarian advance in the south in the event of a Bulgarian intervention.) The Entente also delayed due to protracted secret negotiations aiming at bringing Bulgaria into the Allied camp, which event would have alleviated Serbia's need for Franco-British help. In the event the lack of Allied support sealed the fate of the Serbian Army. Against Serbia the Central Powers marshalled the Bulgarian Army, a German Army, and an Austro-Hungarian Army, all under the command of Field Marshal Mackensen. The Germans and Austro-Hungarians began their attack on 7 October with a massive artillery barrage, followed by attacks across the rivers. Then, on 11 October, the Bulgarian Army attacked from two directions, one from the north of Bulgaria towards Niš, the other from the south towards Skopje (see map). The Bulgarian Army rapidly broke through the weaker Serbian forces which tried to block its advance. With the Bulgarian breakthrough, the Serbian position became hopeless; their main army in the north faced either encirclement and enforced surrender, or retreat. Marshal Putnik ordered a full Serbian retreat, southwards and westwards through Montenegro and into Albania. The Serbs faced great difficulties: terrible weather, poor roads and the need for the army to help the tens of thousands of civilians who retreated with them. Only c. 125,000 Serbian soldiers reached the Adriatic coast and embarked on Italian transport ships that carried the army to Corfu and other Greek islands before it travelled on to Thessaloniki. Marshal Putnik had to be carried during the whole retreat; he died just over a year later in a French hospital. French soldiers halting in Thessaloniki (1915). The French and British divisions marched north from Thessaloniki in October 1915 under the joint command of French General Maurice Sarrail, and Irish General Bryan Mahon (Commander, British Salonika Force, 1915). However, the War Office in London was reluctant to advance too deep into Serbia. So the French divisions advanced on their own up the Vardar River. This advance gave some limited help to the retreating Serbian Army, as the Bulgarians had to concentrate larger forces on their southern flank to deal with the threat, which led to the Battle of Krivolak (October–November 1915). By the end of November, General Sarrail had to retreat in the face of massive Bulgarian assaults on his positions. During his retreat, the British at Kosturino were also forced to retreat. By 12 December, all allied forces were back in Greece. The Germans ordered the Bulgarians not to cross the Greek borders, reluctant to risk a Greek entry into the war in response to a Bulgarian invasion in Macedonia. The Allies for their part took advantage of that, reinforcing and consolidating their positions behind the borders. Thus there resulted a clear, albeit incomplete victory for the Central Powers. As a consequence they opened the railway line from Berlin to Constantinople, allowing Germany to prop up its weaker partner, the Ottoman Empire. Despite the Central Powers' victory, the Allies managed to save a part of the Serbian Army, which although battered, seriously reduced and almost unarmed, escaped total destruction and after reorganising resumed operations six months later. And most damagingly for the Central Powers, the Allies—using the moral excuse of saving the Serbian Army—managed to replace the impossible Serbian front with a viable one established in Macedonia (albeit by violating the territory of an officially neutral country); a front which would prove key to their final victory three years later. Fighting along the Greek border, 1916. On 5 January 1916, the Austro-Hungarian Army attacked Serbia's ally Montenegro. The small Montenegrin army offered strong resistance in the Battle of Mojkovac, which greatly helped the withdrawal of the Serbian Army, but soon faced impossible odds and was compelled to surrender on 25 January. The Austro-Hungarians advanced down the coast of the Adriatic Sea into Italian-controlled Albania. By the end of the winter, the small Italian army in Albania had been forced out of nearly the whole country. At this point, with the war in the Balkans almost lost, the British General Staff wanted to withdraw all British troops from Greece, but the French government protested strongly and the troops remained. The Allied armies entrenched around Thessaloniki, which became a huge fortified camp, earning themselves the mocking nickname "the Gardeners of Salonika". The Serbian Army (now under the command of General Petar Bojović), after rest and refit on Corfu, was transported by the French to the Macedonian Front. In the meantime, the political situation in Greece was confused. Officially, Greece was neutral, but King Constantine I was pro-German, while Prime Minister Eleftherios Venizelos was pro-Allied. Venizelos invited the Entente into Thessaloniki. With knowledge that Romania was about to join the Allied side, General Sarrail began preparations for an attack on the Bulgarian armies facing his forces. The Germans made plans of their own for a "spoiling attack". The German offensive was launched on 17 August, just three days before the French offensive was scheduled to start. In reality, this was a Bulgarian offensive, as the Austro-Hungarian Army was in Albania and only one German division was on the Greek border. The Bulgarians attacked on two fronts. In the east, they easily conquered all Greek territory east of the river Struma (see Struma Offensive), since the Greek Army was ordered not to resist by the pro-German King Constantine. In the west, the attack achieved early success thanks to surprise but the Allied forces held a defensive line after two weeks. Having halted the Bulgarian offensive, the Allies staged a counter-attack starting on 12 September (Battle of Kaymakchalan). The terrain was rough and the Bulgarians were on the defensive but the Allied forces made steady gains. Slow advances by the Allies continued throughout October and on into November, even as the weather turned very cold and snow fell on the hills. The Germans sent two more divisions to help bolster the Bulgarian Army but by 19 November the French and Serbian Army captured Kaymakchalan, the highest peak of Nidže mountain, and compelled the Central powers to abandon Bitola to the Entente; c. 60,000 Bulgarians and Germans were killed, wounded or captured. The Allies suffered c. 50,000 battle casualties but another 80,000 men died or were evacuated due to sickness. The front moved about 25 miles (40 km). The unopposed Bulgarian advance into Greek-held eastern Macedonia precipitated a crisis in Greece. The royalist government ordered its troops in the area (the demobilised IV Corps) not to resist and to retreat to the port of Kavala for evacuation, but no naval vessels turned up to permit the evacuation to take place. Despite occasional local resistance from a few officers and their nucleus units, most of the troops, along with their commander, surrendered to a token German force and were interned for the remainder of the war at Görlitz, Germany. The surrender of territory recently won with difficulty in the Second Balkan War of 1913 was the last straw for many Venizelist army officers. With Allied assistance, they launched a coup which secured Thessaloniki and most of Greek Macedonia for Venizelos. From that point Greece had two governments: the "official" royal government at Athens, which maintained Greek neutrality, and the "revolutionary" Venizelist "Provisional Government of National Defence" at Thessaloniki. At the same time, the Italians had deployed more forces to Albania and these new troops managed to push the Austrian corps back through very hilly country south of Lake Ostrovo. By spring 1917, General Sarrail's Allied Army of the Orient had been reinforced to 24 divisions, six French, six Serbian, seven British, one Italian, three Greek and two Russian brigades. An offensive was planned for late April but the initial attack failed with major losses and the offensive was called off on 21 May. The Venizelists and the Entente, wishing to exert more pressure on Athens, occupied Thessaly, which had been evacuated by the royalists and the Isthmus of Corinth, dividing the country. After an attempt to occupy Athens by force, that caused the reaction of the local royalist forces and ended in an fiasco in December (see Noemvriana), the Allies established a naval blockade around southern Greece which was still loyal to king Constantine, causing extreme hardship to the people in those areas. 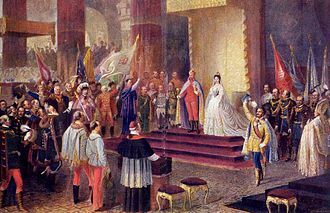 Six months later in June, the Venizelists presented an ultimatum, resulting in the exile of the Greek king (on 14 June, his son Alexander became king) and the reunification of the country under Venizelos. 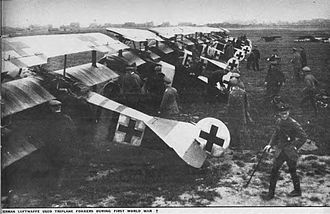 The new government immediately declared war on the Central Powers and created a new Army. Colonel Nikolaos Christodoulou, one of the leaders of the Greek National Defence Army, interrogates Bulgarian prisoners of war. French gunners with 75 mm anti-aircraft gun in Thessaloniki. On 30 May 1918, the Allies launched an offensive on the heavily fortified Skra salient, commencing the battle of Skra-di-Legen. The battle marked the first major Greek action on the Allied side in the war. Utilizing the cover of heavy artillery a Franco-Hellenic force made a rapid push into the enemy trenches, conquering Skra and the surrounding system of fortifications. Greek casualties amounted to 434–440 killed in action, 154–164 missing in action and 1,974–2,220 wounded, France lost approximately 150 men killed or injured. A total of 1,782 soldiers of the Central Powers became prisoners of war, including a small number of German engineers and artillery specialists that served in Bulgarian units; considerable amounts of military equipment also fell into Entente hands. The plan for a Bulgarian counterattack against Skra remained unfulfilled as the Bulgarian soldiers refused to take part in the operation. Both the Greek and the French press used the opportunity to extol the efforts of the Greek army, favourably influencing the Greek mobilisation. The fall of Skra prompted Bulgarian prime minister Vasil Radoslavov to resign on 21 June 1918. Aleksandar Malinov who assumed office immediately afterwards pursued secret negotiations with Britain, offering Bulgaria's exit from the war with the condition that Bulgaria fully retain eastern Macedonia. However, British prime minister David Lloyd George rejected the proposal, assuring the Greek ambassador in London Ioannis Gennadius, that Britain would not act against Greek interests. 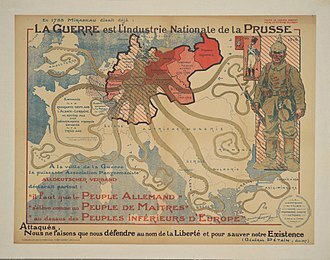 With the German spring offensive threatening France, Guillaumat was recalled to Paris and replaced by General Franchet d'Esperey. 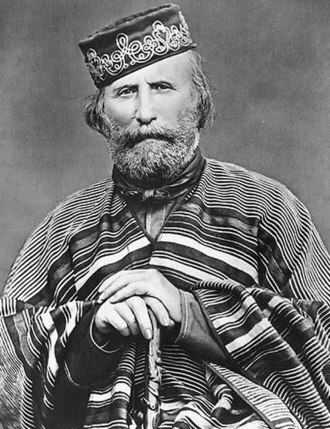 Although d'Esperey urged an attack on the Bulgarian Army, the French government refused to allow an offensive unless all the countries agreed. General Guillaumat, no longer needed in France, travelled from London to Rome, trying to win approval for an attack. Finally in September, agreement was reached and d'Esperey was allowed to launch his grand offensive. The Allied forces were now very large, despite the Russians being obliged to cease their participation due to the Treaty of Brest-Litovsk in March 1918. Not only did the Entente have the Greek army fully on their side (9 divisions strong), but they also had some 6,000 men from the Czechoslovak Legion, who had been evacuated from Russia and sailed around the world, ready to fight the Austro-Hungarians. The Bulgarians had also increased their army during 1917 and in total manpower, the two sides were roughly equal (291 Allied battalions vs. 300 Bulgarian battalions, plus ten German battalions). The Allies were certain of their impending victory, while the Bulgarians could see the war was lost. 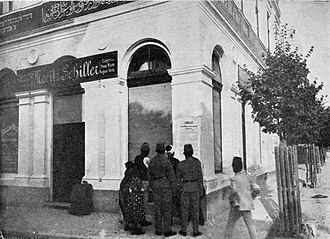 The Ottoman Empire was near collapse, the Austro-Hungarian government was in chaos and the German Army was beaten on the decisive Western Front. The preparatory artillery bombardment of enemy positions for the Battle of Dobro Pole began on 14 September. The following day, the French and Serbians attacked and captured their objective. 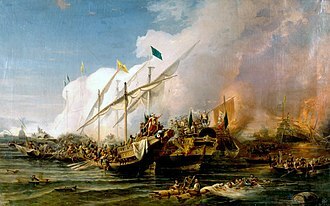 On 18 September, the Greeks and the British attacked but were stopped with heavy losses by the Bulgarians in the Battle of Doiran. The Franco-Serbian army continued advancing vigorously and next day, some Bulgarian units started surrendering positions without a fight and the Bulgarian command ordered a retreat. In the official British government history of the Macedonian campaign, Cyril Falls wrote a detailed analysis of the situation of the Bulgarian forces and the situation of the front. Although a breakthrough was achieved at Dobro Pole and the allied forces continued their advance, the Bulgarian army was not routed and managed an orderly retreat. By 29 September (a day before Bulgaria exited World War I), Skopje fell but a strong Bulgarian and German force had been ordered to try and retake it the next day; the number of Bulgarian prisoners-of-war in allied hands around that day was only 15,000. Another major factor contributed to the Bulgarian request for an armistice. A mass of retreating Bulgarian mutineers had converged on the railway centre of Radomir in Bulgaria, just 30 miles (48 km) from the capital city of Sofia. On 27 September, leaders of the Bulgarian Agrarian National Union took control of these troops and proclaimed the overthrow of the monarchy and a Bulgarian republic. About 4,000–5,000 rebellious troops threatened Sofia the next day. Under those chaotic circumstances a Bulgarian delegation arrived in Thessaloniki to ask for an armistice. On 29 September, the Bulgarians were granted the Armistice of Thessaloniki by General d'Esperey, ending their war. The Macedonian front was brought to an end at noon on 30 September 1918 when the ceasefire came into effect. The Soldiers' Uprising was finally put down by 2 October. Tsar Ferdinand I of Bulgaria abdicated and went into exile on 3 October. The British Army headed east towards the European side of the Ottoman Empire, while the French and Serbian forces continued north and liberated Serbia, Albania and Montenegro. The British Army neared Constantinople and with no serious Ottoman forces to stop it the Ottoman government asked for an armistice (the Armistice of Mudros) on 26 October; Enver Pasha and his partners had fled several days earlier to Berlin. The Serbo-French Army re-captured Serbia and overran several weak German divisions that tried to block its advance near Niš. On 3 November Austria-Hungary was forced to sign an armistice on the Italian Front and the war there ended. 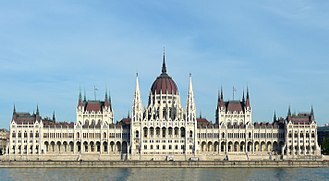 On 10 November, d'Esperey's army crossed the Danube river and was poised to enter the heartland of Hungary. At the request of the French general, Count Károlyi, leading the Hungarian government, came to Belgrade and signed another armistice, the Armistice of Belgrade. Memorials erected in the area include the Doiran Memorial to the dead of the British Salonika Army. ^ Total Serbian military casualties in World War I numbered approximately 481,000, including 278,000 dead from all causes (including POWs), 133,000 wounded, and 70,000 living POWs. Of these 481,000, some 434,000 were suffered in the earlier Serbian Campaign. Most of the rest were taken on the Macedonian Front following the evacuation of the Serbian Army. ^ Villari 1922, p. 206. ^ "Archived copy". Archived from the original on 2015-11-18. Retrieved 2015-05-19. CS1 maint: Archived copy as title (link) turkeyswar, Campaigns, Macedonia front. ^ Military Casualties-World War-Estimated," Statistics Branch, GS, War Department, 25 February 1924; cited in World War I: People, Politics, and Power, published by Britannica Educational Publishing (2010) Page 219. Losses for Bulgaria in the whole war are given as 266,919 (including killed and died 87,500; wounded 152,930; Prisoners and missing 27,029). Bar 30,250 casualties in the Romanian Campaign and 37,000 casualties in the Serbian Campaign, all these losses were taken on the Salonika Front. ^ T. J. Mitchell and G.M. Smith. "Medical Services: Casualties and Medical Statistics of the Great War." From the "Official History of the Great War". Pages 190-191. Breakdown: 2,797 killed, 1,299 died of wounds, 3,744 died of disease, 2,778 missing/captured, 16,888 wounded (minus DOW), 116,190 evacuated sick (34,726 to UK, 81,428 elsewhere) an unknown proportion of whom returned to duty later. A total of 481,262 were hospitalized for sickness overall. ^ Ministero della Difesa: L’Esercito italiano nella Grande Guerra (1915-1918), vol. VII: Le operazioni fuori del territorio nazionale: Albania, Macedonia, Medio Oriente, t. 3° bis: documenti, Rome 1981, Parte Prima, doc. 77, p. 173 and Parte Seconda, doc. 78, p. 351; Mortara, La salute pubblica in Italia 1925, p. 37. ^ Losses are given as follows for 1916 to 1918. Macedonia: 8,324, including 2,971 dead or missing and 5,353 injured. Albania: 2,214 including 298 dead, 1,069 wounded, and 847 missing. ^ Falls 1933, pp. 1–22. ^ Falls 1933, pp. 22–33. ^ Falls 1933, pp. 33–39. ^ Falls 1933, pp. 31–32, 42–50. ^ Falls 1933, pp. 33–37. ^ Falls 1933, pp. 57–62. ^ Falls 1933, pp. 50–84. ^ a b Falls 1933, pp. 85–103. ^ Falls 1933, pp. 32–36. 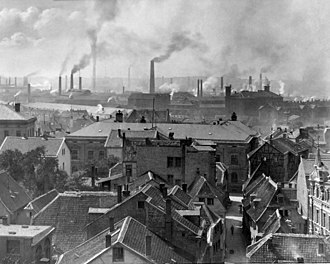 ^ Falls 1933, p. 110. ^ Falls 1933, pp. 119–120. ^ Falls 1933, pp. 107, 130. ^ Falls 1933, pp. 104–111. ^ Falls 1933, pp. 152–184. ^ Falls 1933, pp. 172–196 234–240. ^ Falls 1933, pp. 208–230, 348–261. ^ Falls 1933, pp. 302–345. ^ Falls 1933, pp. 348–362. ^ Falls 1935, p. 89. ^ Geramanis 1980, p. 89. ^ Villari 1922, pp. 196–198. ^ Omiridis Skylitzes 1961, pp. 38–44. ^ Vaidis 1979, pp. 258–262. ^ Falls 1935, pp. 101–112. ^ Falls 1935, pp. 147–158. ^ Falls 1935, pp. 159–192. ^ Falls 1935, pp. 193–202. ^ Falls 1935, pp. 203–245. ^ Falls 1935, pp. 246–253. ^ Falls 1935, pp. 254–279. ^ Urlanis, Boris (1971). Wars and Population. Moscow. pp. 66, 79, 83, 85, 160, 171, 268. ^ Statistics of the Military Effort of the British Empire During the Great War 1914–1920. The War Office. p. 353. Owen, Collinson (2012). Salonica and After the Sideshow That Ended the War. Charleston, SC: Forgotten Books. ASIN B008VGLK3Q. Dieterich, Alfred (1928). Weltkriegsende an der mazedonischen Front [The End of the World War at the Macedonian Front] (in German). Berlin: Gerhard Stalling. OCLC 248900490. Falls, C. (1996) . Military Operations Macedonia: From the Outbreak of War to the Spring of 1917. History of the Great War Based on Official Documents by Direction of the Historical Section of the Committee of Imperial Defence. I (Imperial War Museum and Battery Press ed.). London: HMSO. ISBN 0-89839-242-X. Falls, C. (1996) . Military Operations Macedonia: From the Spring of 1917 to the End of the War. History of the Great War Based on Official Documents by Direction of the Historical Section of the Committee of Imperial Defence. II (Imperial War Museum and Battery Press ed.). Nashville, TN: HMSO. ISBN 0-89839-243-8. Villari, Luigi (1922). The Macedonian Campaign. London: T. Fisher Unwin. OCLC 6388448. Retrieved 13 September 2015. Omiridis Skylitzes, Aristeidis (1961). Ο Ελληνικός Στρατός κατά τον Πρώτον Παγκόσμιον Πόλεμον, Τόμος Δεύτερος, Η Συμμετοχή της Ελλάδος εις τον Πόλεμον 1918 [Hellenic Army During the First World War 1914–1918: Hellenic Participation in the War 1918] (in Greek). II. Athens: Hellenic Army History Department. Geramanis, Athanasios (1980). Πολεμική Ιστορία Νεωτέρας Ελλάδος: Επιχειρήσεις εν Μακεδονία κατά τον Α' παγκόσμιον πόλεμον 1915–1918 [Military History of Modern Greece Operations in Macedonia During WWI 1915–1918] (in Greek). IV. Athens: Kefallinos. Palmer, Alan (2011). The Gardeners of Salonika: The Macedonian Campaign 1915-1918. Faber & Faber. ISBN 978-0-571-28093-3. Vaidis, Theodoros (1979). Η Βιβλος του Ελευθεριου Βενιζελου:Ιστορια της Νεωτερας Ελλαδος, 1917–1922 [The Bible of Eleftherios Venizelos: History of Modern Greece, 1917–1922] (in Greek). IV. Athens: Smyrniotakis. Wikimedia Commons has media related to Macedonian Front. Azmanov, Dimitar (1935). Урокът от Добро поле [The Lesson of Dobro Pole] (in Bulgarian). Sofia: Knipegraf. Richard Harding Davis (2014). With the French in France and Salonika. Read Books Limited. ISBN 978-1-4733-9677-7. Leontaritis, Georgios (2005). Ελλάδα στον Πρώτο Παγκόσμιο πόλεμο 1917–1918 [Greece during the First World War 1917–1918] (in Greek). Athens: Hellenic National Bank Educational Institution. ISBN 960-250-195-2. Mitrović, Andrej (2007). Serbia's Great War, 1914–1918. London: Hurst. ISBN 978-1-55753-477-4. Nedev, Nikola (1923). Дойранската епопея 1915 – 1918 [The Doiran Epopee 1915–1918] (in Bulgarian). Sofia: Armeiski voenno-izdatelski fond. ISBN 978-954-8247-05-4. Vittos, Christos (2008). Εθνικός διχασμός και η Γαλλική κατοχή : (1915–1920) [National Schism and the French Occupation: (1915–1920)] (in Greek). Thessaloniki: Olympos. ISBN 978-960-8237-30-8. Wakefield, Alan; Moody, Simon (2004). Under the Devil's Eye: Britain's Forgotten Army at Salonika 1915–1918. London: The History Press. ISBN 978-0750935371. Ethniko Hidryma Ereunōn kai Meletōn "Eleutherios K. Venizelos". (2005). The Salonica theatre of operations and the outcome of the Great War. Institute for Balkan Studies. ISBN 978-960-7387-39-4. The Allies of World War I were the countries that opposed the Central Powers in the First World War. The members of the original Triple Entente of 1907 were the French Republic, the British Empire, Serbia, Greece and Romania were affiliated members of the Entente. The 1920 Treaty of Sèvres defines the Principal Allied Powers as the British Empire, French Republic, the Allied Powers comprised, together with the Principal Allied Powers, Belgium, Hejaz, Portugal, Serb-Croat-Slovene state and Czechoslovakia. 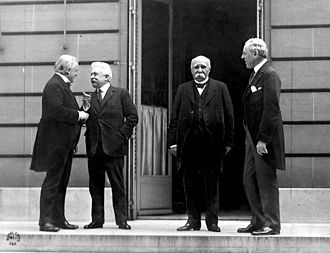 The U. S. declaration of war on Germany, on 6th April 1917 was on the grounds that Germany had violated its neutrality by attacking international shipping and it declared war on Austria-Hungary in December 1917. 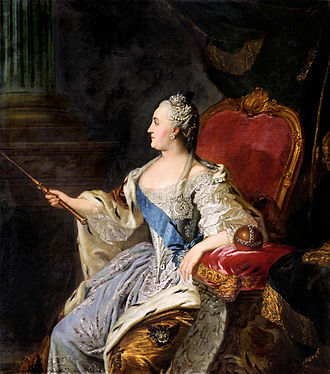 The U. S. entered the war as a power, rather than as a formal ally of France. 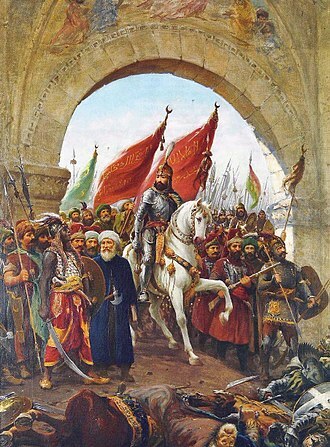 Although the Ottoman Empire and Bulgaria severed relations with the United States, the Dominion governments did control recruiting, and removed personnel from front-line duties as they saw fit. From early 1917, the War Cabinet was superseded by the Imperial War Cabinet, in April 1918, operational control of all Entente forces on the Western Front passed to the new supreme commander, Ferdinand Foch of France. The Austrian Empire followed with an attack on the Serbian ally Montenegro on 8 August, on the Western Front, the two neutral States of Belgium and Luxembourg were immediately occupied by German troops as part of the German Schlieffen Plan. On 23 August Japan joined the Entente, which counted seven members, the entrance of the British Empire brought Nepal into the war. In 1916, Montenegro capitulated and left the Entente, and two nations joined and Romania, on 6 April 1917, the United States entered the war. Liberia and Greece became allies and this was followed by Romanian cessation of hostilities, however the Balkan State declared war on Central Powers again on 10 November 1918. In response to the Germans invasion of neutral Belgium, the United Kingdom declared war on Germany on 4 August 1914, gibraltar and Malta were British dependencies in Europe. The UK held several colonies and semi-autonomous dependencies at the time of World War I, in Eastern Africa the East Africa Protectorate, both Northern and Southern Rhodesia, the Uganda Protectorate, were involved in conflict with German forces in German East Africa. Since 1817 the Principality was ruled by the Obrenović dynasty. 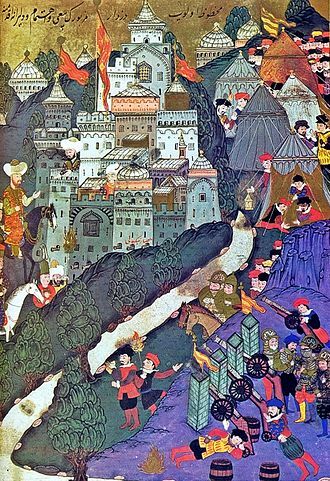 The Principality, suzerainty of the Ottoman Empire, de facto achieved independence when the last Ottoman troops left Belgrade in 1867. In 1882 King Milan I proclaimed the Kingdom of Serbia and maintained a foreign policy friendly to Austria-Hungary, between 1912 and 1913 Serbia greatly enlarged its territory through engagement in the First and Second Balkan Wars - Sandžak-Raška, Kosovo Vilayet and Vardar Macedonia were annexed. As outcome of the World War I in 1918 it united with Vojvodina, the Principality of Serbia was a state in the Balkans that came into existence as a result of the Serbian revolution which lasted between 1804 and 1817. At first, the principality included only the territory of the former Pashaluk of Belgrade, but in 1831-1833 it expanded to the east, south, in 1867 the Ottoman army left the Principality, securing its de facto independence. Serbia expanded further to the south-east in 1878, when it won international recognition at the Congress of Berlin. In 1882 it was raised to the level of the Kingdom of Serbia, the Serbo-Bulgarian War erupted on November 14,1885 and lasted until November 28 of the same year. The war ended in defeat for Serbia, as it had failed to capture the Slivnitsa region which it had set out to achieve. Bulgarians successfully repelled the Serbs after the victory at the Battle of Slivnitsa and advanced into Serbian territory taking Pirot. When Austria-Hungary declared that it would join the war on the side of Serbia, Bulgaria withdrew from Serbia leaving the Serbo-Bulgarian border precisely where it had prior to the war. The peace treaty was signed on February 19,1886 in Bucharest, as a result of the war, European powers acknowledged the act of Unification of Bulgaria which happened on September 6,1885. In 1888 Peoples Radical Party led by Sava Grujić and Nikola Pašić came to power, the lost war and the Radical Partys total electoral victory were some of the reasons why King Milan I abdicated in 1889. 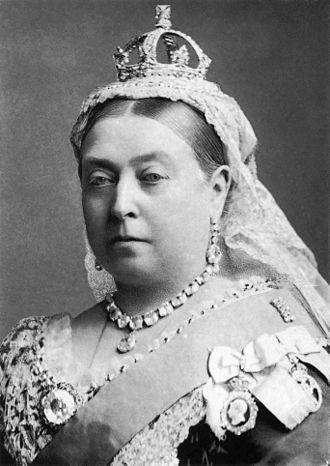 His son Alexander I assumed the throne in 1893 and in 1894 dismissed the constitution, King Alexander I of Serbia and his unpopular wife Queen Draga, were assassinated inside the Royal Palace in Belgrade on the night of 28–29 May 1903. The Armistice of Salonica was signed on 29 September 1918 between Bulgaria and the Allied Powers in Thessaloniki. The convention followed after a request by the Bulgarian government on 24 September asking for a ceasefire, the armistice effectively ended Bulgarias participation in World War I on the side of the Central Powers and came into effect on the Bulgarian front at noon on 30 September. The armistice regulated the demobilization and disarmament of the Bulgarian armed forces, the terms of the armistice called for the immediate demobilization of all Bulgarian military activities. German and Austrian-Hungarian troops had to leave Bulgaria within 4 weeks and especially Sofia were not to be occupied, but the Allies had the right to temporarily occupy some strategic points and to transfer troops over Bulgarian territory. According to the five of the Armistice about 150000 Bulgarian soldiers that have been situated on the West of Skopje meridian have been delivered to Entente’s forces as hostages. Maurice-Paul-Emmanuel Sarrail was a French general of the First World War. He was dismissed for poor leadership, amidst political uproar, in July 1915, despite a number of offensives, Sarrails forces did not succeed either in conquering Bulgaria or in preventing the Central Powers conquest of Serbia in 1915 or Romania in 1916. Sarrail was dismissed from his Salonika command in December 1917 and he played a role in the French suppression of the Great Syrian Revolt in the mid 1920s. Sarrail was born at Carcassonne, and attended St Cyr, graduating in third place on 1 October 1877 and he was posted as a sub-lieutenant to the infantry. His regimental service and promotion followed the normal course and he was promoted to lieutenant in October 1882, captain in 1887, and chef-de-bataillon in 1897. 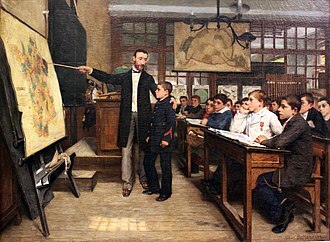 In 1901 he was appointed Commandant of the École Militaire dInfanterie, in 1902 he was promoted lieutenant-colonel. From 1904 to 1906 he was Military Commandant of the Palais Bourbon, which housed the Chamber of Deputies, in 1907 he became Director of Infantry at the War Office , an appointment which he held for four years. He was made General de Brigade in 1908, in 1911 he was promoted General de Division when his radical Socialist friend Caillaux formed his first government, and on 1 November 1913 he was given command of VIII Corps. Unlike many French officers, Sarrail was a freemason and a Dreyfusard, after a left-wing government came to power in 1914, he was due to be appointed Commander-in-Chief designate in Joffres place in the autumn, but war broke out before this could take place. At Virton in the Ardennes in August 1914 he commanded VI Corps, VI Corps was strengthened with an extra infantry division, and faced German VI Reserve Corps. Sarrails was the corps of Ruffey’s Third Army to withstand the strong German counterattacks. It was eventually forced to back to avoid encirclement. Sarrail told 42nd Division, which formed the rearguard, “you have given proof of cran ”, on 30 August Sarrail was promoted to succeed Ruffey in command of Third Army. In early September IV Corps was removed from his command and sent to Maunoury’s new Sixth Army near Paris, in early September Sarrail, along with Franchet d’Esperey and Foch, was ordered to stop retreating and be ready to counterattack. Field Marshal George Francis Milne, 1st Baron Milne GCB, GCMG, DSO was a senior British Army officer who served as Chief of the Imperial General Staff from 1926 to 1933. He served in the Second Boer War and during the First World War he served briefly on the Western Front but spent most of the war commanding the British forces on the Macedonian front. As CIGS he generally promoted the mechanization of British land forces although limited practical progress was made during his term in office. He was initially posted to a battery at Trimulgherry in India, promoted to captain on 4 July 1895, he joined the garrison artillery in Malta and took part in the Suakin Expedition in 1896. Next he was appointed captain at Hilsea and attended the Staff College. There he became a friend of his classmate William Robertson and he took part in the Nile Expedition in 1898, seeing action at Omdurman and scoring a direct hit on the Mahdis tomb with his battery. He was mentioned in despatches on 2 April 1901, and awarded the Distinguished Service Order in the South Africa Honours list published on 26 June 1902. At the outbreak of the First World War in July 1914 and he fought on the Marne and the Aisne. He joined the staff of III Corps in January 1915 and. He was appointed General Officer Commanding 27th Division in July 1915, Milne was appointed to command XVI Corps in Salonika in January 1916 with orders to oppose Bulgarian advances on the Macedonian front. When he succeeded Bryan Mahon as Commander-in-Chief of the British Salonika Army, as late as 3 June 1916 Milne was ordered by Robertson, now Chief of the Imperial General Staff, not to participate in any attack on the Bulgars. He was awarded the Grand Cross of the Order of the White Eagle by the King of Serbia on 1 July 1916. With Bulgaria seeming close to collapse in October and November 1916, the 60th Division was sent to Salonika in December. Milne was promoted to permanent lieutenant general on 1 January 1917, on 3 January 1917 Milne arrived at the Rome Conference independently of the French General Sarrail. The official French record of the Rome Conference did not even mention Milne as a participant and this precedent was much discussed in the next few months when David Lloyd George, the Prime Minister, attempted to place the BEF on the Western Front under General Robert Nivelle. Kliment Boyadzhiev was a Bulgarian General during the Balkan Wars and First World War. Born in Ohrid, he studied in a school there. After the liberation of Bulgaria in 1878 he emigrated to Sofia, in 1883 he graduated the Military School in Sofia and in 1895 graduated the Military Academy in Torino, Italy with excellent marks. During the successful Serbo-Bulgarian War in 1885 he was an aide-de-camp in the Western Corps quarters and he distinguished himself in the battle of Lule Burgas during the First Balkan War as a commander of the Fourth Preslav Infantry Division. Between 22 August 1913 and 1 September 1913 Kliment Boyadzhiev was the Minister of War, during the First World War he commanded the 1st Army which achieved major successes against the Serbs in the battle of Morava and the battle of Kosovo. Boyadzhiev remained in position until 25 September 1916 when he was replaced by Dimitar Geshov. The general was awarded four Bulgarian medals for courage and bravery as well as one Russian, after the war between 1918 and 1923 he emigrated to Germany. Diterikhs was said to be a deeply religious man, the walls of whose private railway coach were plastered with icons and believed that he was waging a holy war against the Bolshevik heathens. 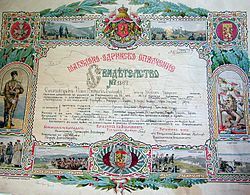 Diterikhs was born to a father of far German ancestry who served a general of the Russian Imperial Army in the Caucasus, in 1900, Diterikhs graduated from the Page Corps and was assigned a post in the Life Guards 2nd Artillery Brigade. In 1900, he graduated from the Nikolaevsky Military Academy in St. Petersburg, from 1900 to 1903 he served in various the staff positions in the Moscow Military District. In 1903 he was appointed commander of the squadron in the 3rd Dragoon Regiment, with the start of the Russo-Japanese War in 1904, Diterikhs became chief officer for special duties at the 17th Army Corps headquarters. He arrived at the front in Manchuria in August 1904, and participated in the Battle of Liaoyang, Battle of Shaho, by the end of the war, he was a lieutenant. 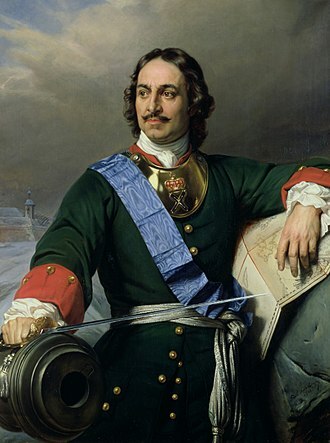 After the end of the war he returned to Moscow, the following year, he had the same position at the Kiev Military District headquarters. He was promoted to colonel in 1909, in 1910, he served as a senior aide at the Kiev Military District headquarters. From 1913, Diterikhs was head of the Mobilization Department of the Main Directorate of the General Staff, in September of the same year, he commanded a Russian expeditionary force in Thessaloniki on the Macedonian front in support of the Serbian Army. After the February Revolution, Diterikhs was recalled to Russia, in August 1917 the Russian Provisional Government offered Diterikhs the position of Minister of War, which he refused. By November 3,1917, Diterikhs was promoted to the chief of staff of the Russian armys headquarters, Diterikhs escaped to Kiev, made his way to Siberia where the Czechoslovak Legions asked him to become their chief of staff. 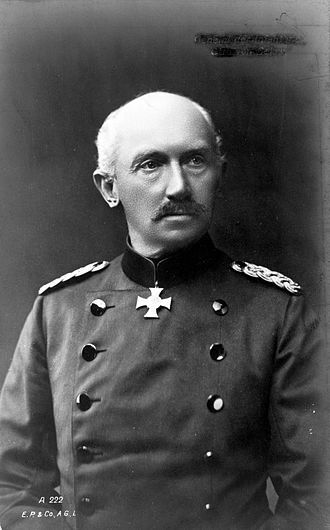 He helped the Czech Legion to organize their first resistance in May 1918, Diterikhs was ordered by Admiral Kolchak to arrest the Ufa directory but delayed his move. After a few days on November 26,1918 he finally agreed to obey to Kolchaks order, from January to July 1919 Diterikhs personally supervised the Sokolovs investigation of the murder of Tsar Nicholas II. In July 1919 Diterikhs took command of the Siberian Army of Admiral Kolchak and he assisted in creation of various paramilitary militias in support of the White movement and the Russian Orthodox Church against the Bolsheviks. In September 1919 he commanded Admiral Kolchak’s last successful offensive against the Red Army, however, in December 1919 he resigned after a bitter quarrel with Kolchak and emigrated to Harbin in Manchuria. Periodically Diterikhs figured in the negotiations between the Provisional Priamurye Government and other White forces, on June 8,1922, Diterikhs returned to take over the Army of Verzhbitski as well as the civil administration. Based in the Amur Krai, Diterikhs proceeded to reorganize the army and civil government, taking a hands-on approach, Diterikhs made efforts to enlist the support of the local population for his cause, calling his battle a religious crusade against Bolshevism. He had tried, in vain, to convince the Japanese not to withdraw their military support, Diterikhs founded the last Zemsky Sobor on Russian soil on July 23,1922. August von Mackensen in full hussar uniorm. Field Marshal Mackensen reviewing Bulgarian troops followed by Crown Prince Boris (c. 1916). An allied cemetery at Thessaloniki (Salonika). The I National Defence Battalion marches before the White Tower on its way to the front. Eleftherios Venizelos inspects a newly raised unit of the Army of National Defence, before its departure for the front. Živojin Mišić's statue in Valjevo. Italian soldiers in Vlorë, Albania during World War I. The tricolour flag of Italy bearing the Savoy royal shield is shown hanging alongside an Albanian flag from the balcony of the Italian prefecture headquarters. The Bulgarian delegates: Major General Ivan Lukov, Andrey Lyapchev and Simeon Radev.